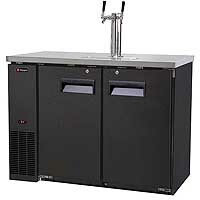 The Kegco XCK-2448B Commercial Kegerator is the ideal beer dispenser for small pubs, bars, restaurants and events. It's interior is big enough to hold two full-size kegs or a combination of smaller kegs. Forced air refrigeration keeps the beer in the kegs ice cold and blowers route the cool air into the beer tower to ensure not a drop is wasted. This beer dispenser includes two heavy duty adjustable shelves, providing the ultimate in versatility. You can store cans and bottles or keep mugs frosty on one side while dispensing multiple 5 gallon kegs from the other side! A built-in drip tray that routes to an external drain makes daily maintenance a breeze. The XCK-2448B is ruggedly built to withstand the rigors of commercial use. It features sturdy steel construction with a smooth black exterior finish with an attractive stainless steel top. The interior walls and ceiling are made of stainless steel and a rubber floor mat reduces the shock of the heavy kegs on the stainless steel floor. An internal light conveniently illuminates the cabinet to make adjustments to your dispense system effortless. Hoses inside the cabinet that direct cool air into the draft arm and drain beer from the drip tray to an external drain are efficiently tucked out of the way. The keg cooler is designed for built-in or freestanding use, so the cooling unit is accessible from the front of the kegerator to make servicing the system easy. Comments: The unit is great so why 4 stars. The chilling mechanism works a lot in my opinion especially when you are changing kegs out during the night or in a warmer area. Seems obvious, but runs a lot. Other than that it meets or exceeds my initial expectations and is well worth the purchase. Comments: I had a single keg kegerator that I was stuffing 5 gallon kegs in but kept running into issues where the door wouldn't close properly because a keg was sticking out too far. I wouldn't realize it until I went to pour a beer and it would come out warm and foamy. This commercial unit not only fit my kegs and keep the door closed, but I can put way more kegs in here. I got a 4 faucet tower and dispense system, and I still have room for a 20 lb CO2 tank and a backup keg with space left over! Moving things around in there is a lot easier too. I like that it has shelves but I haven't made use of them yet. I might try moving all my kegs to one side, using the shelves for bottles of craft beer and mounting the CO2 tank externally. Either way, I'm very happy with the extra space and the performance so far. Sure, it's loud as heck, but I expected that considering it's commercial grade. Comments: I bought this Kegerator for my down starirs den area which has a bar. I had purchased appliances from The Beverage Factory before so I felt pretty confident in another purchase. The purchase went well. Delivery was interesting since it had to be carried down stairs, but the delivery guys handled it great. The unit is beautiful and fits perfect in the bar. All was well until I turned it on. I was expecting it to be similar to a refrigerator or freezer in noise level. I was surprised to find it as loud as it is. In fact after I had turned it on and went upstairs my wife asked me what was running downstairs as she could hear it all the way up there. the unit cycles on and off often, as it seems it doesn't hold temp that well. Perhaps it will not cycle as often when it is full of kegs since they will help hold temp. I give it 2 stars solely based on the noise level. Comments: I did a lot of research before purchasing a kegerator system. This is amazing for my house because i was able to use the drain system to go into the sink for a full drainage system. Its super quiet and looks great. It comes with rollers and feet. i did a 4 beer tap system on it and even with 4 slim kegs hooked up there is still room for 2 spare kegs. Price point is worth all the options and commercial grade quality for sure. Comments: I am a homebrewer and this baby holds 4 corny kegs with a 15# CO2 tank and also a 5# NO2 tank for stout. Plenty of room otherwise. Very nice design and well made, the fan makes a difference in the tower keeping it cool. I cut the drip line and routed it inside the fridge into a growler so it doesnt appear outside front (thats a negative IMO). Also its a little loud, but maybe to be expected due to its size. For the price a great unit with 4 tap tower. Neighbors are jealous. Comments: I put this into a home bar so I would be able to enjoy draft beer. Originally, I had a single keg kegerator planned with a similarly sized mini fridge to go next to it. This unit actually fits in the space better and operates as both -- with the added bonus of being able to run two kegs of various sizes. My only issue is the ability to use the unit as a fridge right now. When buying, I knew this was going to be my best option given my specifics. I wanted to run Guinness and another American beer concurrently. Because Guinness is only available to be in 1/2 barrels, I knew I would need some intricately designed system to run two beers if Guinness was one of them without this unit. What I didn't know was how the gases were going to fit with the kegs and if I would still be able to use any of the space as a refrigerator for other items. Here's the deal: the external gas mount would probably be helpful but does not fit into my specific use. So, I am currently running the 1/2 barrel Guinness and a 1/6 barrel of Landshark (AB product) as well as a 5lb CO2 tank and a 40 cu ft. beer gas tank. With the whole get-up, I have enough room a case of beer and some other smaller things. The shelves that come with the unit are not being used and there is limited room for anything else.